The Eurogrand Casino App is a fully suited mobile casino experience powered by Playtech Software and is operated by famous William Hill. This App is suitable for iOS, Android as well as Windows Phone as a Web-App. The Euro Grand Casino is one of the largest online casinos in Europe and is also operated by one of the largest groups of companies in the field of digital entertainment, the William Hill Group. The company has more than 10,000 employees and is listed on the stock exchange in the UK, where it is also licensed (among other licenses worldwide). EuroGrand Casino uses the renowned Playtech software, one of the best casino software providers in the world. With Playtech, graphics, sound, animation and creative game design are particularly emphasized. In addition to the web casino, which is available as a download and flash casino, with the EuroGrand Casino app a portion of the games are available for the mobile phone and smartphone. HTML5 technology was activated in the implementation, thus EuroGrand Mobile also works without a download of a .apk file from the Apple App (iTunes) or Google Play Store. With a QR code, you can place a bookmark on your mobile phone desktop or have a link sent via SMS. The update is automatic; no more annoying app store upgrades. 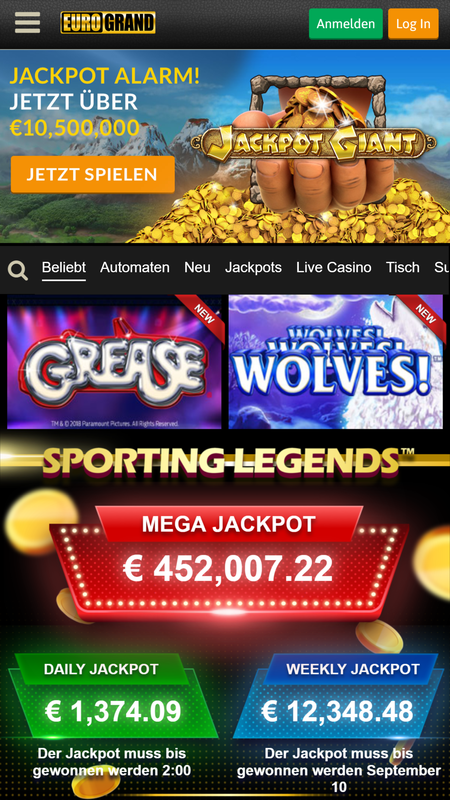 Of the new games uploaded to the EuroGrand app, these are automatically available with the next use of the app. The EuroGrand app is compatible with all major operating systems, from iOS to Android and from Windows Phone 7/8 to BlackBerry OS. Smartphones such as Apple iPhone, Samsung Galaxy, HTCTouch, Sony Xperia or LG, Motorola and Nokia (Lumia) mobile phones can load the app and then play in the EuroGrand Casino. 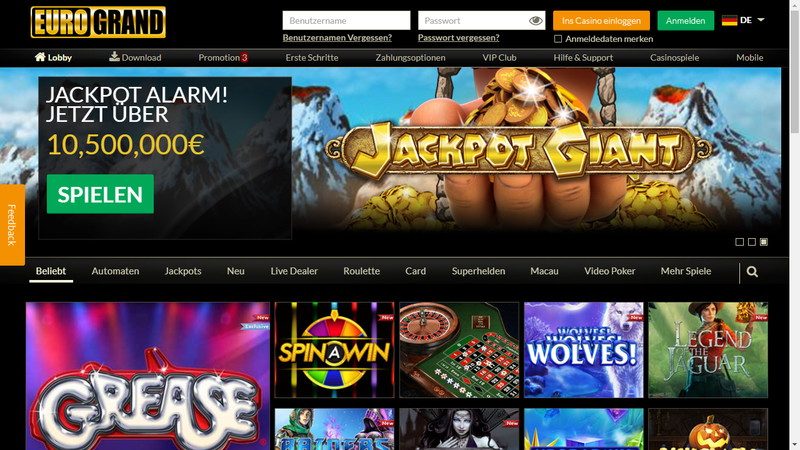 With more than 150 games and numerous jackpots, EuroGrand is one of the most popular casinos. Many slots are available to the players, whether 3 reels or 5. Fascinating games such as X-Men, Fantastic Four, Gladiator, Blade, Rocky, Spin 2 Million, Hulk or Iron Man can be found here. With the mobile, of course you can also play classics such as roulette, baccarrat, blackjack, Caribbean stud poker or video poker (Tens or Better, Jokers Wild, Deuces Wild, etc.) play. But immediate gains are possible with bingo, scratch cards and classic games from lottery and gambling halls. As a special attraction on the web, you can also play Live Dealer Casino, where nice dealers deal the cards. This unfortunately does not work on the EuroGrand app. By the way, the casino app is better played via WLAN versus the mobile network. The EuroGrand customer service is available 7 days a week 24 hours via live chat, by email/form and telephone hotline or fax. The whole thing in 15 languages ​​and quite competent in our test, even concerning questions about the EuroGrand app. Deposits with EuroGrand can be made via the web and via mobile phone. For this purpose there are more than 20 (!) payment methods available on the web, some of which are not so popular in Germany. In addition to credit cards (Visa, Mastercard), one can pay with the wallets Skrill Moneybookers, Neteller, Click2Pay or Paypal. In addition, prepaid cards Ukash and Paysafecard are available. There are no fees to pay; the money is on the account immediately on the account and is usually credited again within a max. of 48 hours if a withdrawal is made. Payments are also possible with the EuroGrand app. The EuroGrand Casino always offers very attractive new customer bonus offers and promotions. These change frequently and range from free play money to no-deposit bonus. Sometimes up to 300% bonus will be paid (deposit 50 euros, play with 300 euros). This extra play money can be used to crack one of the coveted jackpots. The bonus works without a code. Of course it cannot be directly paid out; a few conditions must be met first which are explained in detail on the website. Also at EuroGrand, there is a VIP club for loyal players. Here you can earn points and win bonuses, prizes (travel, etc. ), or participation in exclusive competitions. Playing on the app also earns points. The Euro Grand mobile app for iPhone and Android is a very well made app which enables casino fun at one of the biggest and best casinos without download. In general, the EuroGrand Casino is one of the best and most reputable in Europe and it’s fun to play the software. If you have not tried EuroGrand mobile, give it a try.